Give Mom a great gift this Mother’s Day with our tropical plants that we just got in. Stop by the Madisonville store before they are gone! Create a tropical oasis right in your backyard with our beautiful selection of tropicals. These summer flowers make it easy to get that summer vibe going with their fresh and serene appeal. Mandevillas are a native southwestern United States and Central America tropical plant. 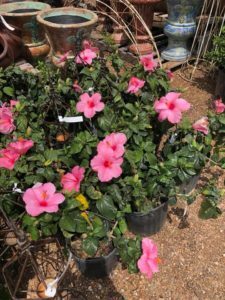 With its stunning pinwheel-shaped flowers and vibrant colors, you will love having this among your summer tropicals. They come in many wonderful colors as well as night illuminating whites. They are easy to care for, thriving in bright, indirect or filtered sunlight. Fertilize it with a high phosphorus fertilizer once every two weeks in the summer and watch it bloom. Make sure you give it a trellis to climb up as it grows. Make your tropical garden interesting by adding some beautiful foliage like Boston ferns. Boston ferns are native to the tropics so these plants thrive in cool places with high humidity and indirect light. Be sure to keep it moist and try to mimic its natural environment. Feed it with a diluted amount of all-purpose fertilizer such as Jack’s All Purpose Fertilizer during the summer months to help its foliage show better. Come down to Standley Feed this May and shop for Mother’s Day and get these beautiful tropical plants! This entry was posted on Tuesday, April 17th, 2018 at 1:54 am	and is filed under Garden, News & Updates. You can follow any responses to this entry through the RSS 2.0 feed. Both comments and pings are currently closed.